Are you a dog owner in Ames looking for dog grooming services close by to you? They’ve only been founded four years ago, but Pepper’s Pawfection has already gained the locals’ trust and lots of happy, good-looking puppers as best testimony of their grooming excellence. The five star reviews all emphasise the warmth and comfort that has been offered to dogs and cats at the grooming salon, and the immediate bond Pepper and other groomers developed with the animals – as if they were their own babies! With over 17 years of experience in handling furry friends in a relaxing, calming way, really shows in comparison to other salons, and that’s what customers – both two and four-legged – happily come back for. Pepper offers all of the standard grooming services, for all sizes of dogs and cats and even small animals, such as rabbits and guinea pigs! The treatments include nail trimming, ear cleaning, teeth brushing, bubbly baths and of course hairstyling. All animals groomed by Pepper and her caring staff, leave with a bow or bandanna to complete the new do! The full list is available on the website and you can contact the groomers directly to enquire about pricing. The salon is open Monday – Friday from 7:30 am, so it shouldn’t be an issue to bring your pet in before work for a quick spa fix! Looking for a truly all-in-one animal care facility that doesn’t compromise quality of services? We think you’ve just found one! Top Paw Grooming Spa does not only offer grooming, bathing and spa treatments, but also daycare. That means you no longer have to worry about picking up your pooch from their appointment, knowing their day will be filled with lots of love and fun times after they’re pampered to perfection. The prices for a full grooming session (nails, ears, shampoo, blow dry and grooming) start at $40 for smaller dogs, and can go up to $65+ depending on the size of your dog. There are plenty of other services Top Paw offers, so if that’s not what you’re looking for exactly, check them out here. If you’d like to book an appointment, find out with package you’re most interested in and call Top Paw at (515) 233.9663. The daycare centre is available for walk-ins, so no need to book! Distemper and Rabies vaccinations are required, whether you’re just bringing your pet in for grooming or wish to use the daycare services. We all just want family-like love and affection for our dogs, so they always feel at home wherever they go – Moni from Serenity Pet Spa provides just that, as well as plenty of experience and a professional, yet friendly approach. As the name indicates, a calming, serene environment is always maintained to make your dog as relaxed, as you would feel going to a hooman spa. The grooming services offered also resemble those from your last spa weekend: hot oil rubs, massages, moisturising and a facial scrub are only the top of the list, and the amazing treatments just go on and on. Whatever your pooch needs, you can be sure to find that at Moni’s Spa, lovingly performed by one of her trusted, certified groomers. Prices are dependent on size and coat type – it’s best to contact the salon for a quote, as you can also book your appointment straightaway via phone. If you’re looking for care facilities for your furry friend, Serenity also offers daycare and boarding. You can find all the additional information on their website. Show your dog some love and book them in for a surprise spa day – they’re bound to thank you with cuddles and kisses! Jasmine, aka Jazzy, only has eyes for dogs and cats and you don’t have to go far to see that. The Facebook page for Jazzy Grooms is filled with pictures of furry friends, who visit her every day and she couldn’t be happier to see and serve them! Jasmine began her career in animal care and grooming nine years ago, and she’s still learning new skills to get better every single day. She’s very thorough and time-efficient with her sessions, so you can actually check the time estimates for types of appointments here and plan your day around them better! Proof of vaccination against Rabies and Distemper is required to book an appointment. A full grooming package starts at $53 for a smaller dog, yet it’s only an estimate. The final price quote is available once Jasmine sees and evaluates your pooch, to avoid any hidden fees and nasty surprises, like fleas or bad behaviour. If you fear that your dog might be anxious or hyper when being groomed, Jasmine offers a 15-minute practice visit, when she can get to know the furry customer and see what she’s working with exactly. You can contact Jasmine via phone ((515) 520-8509) or e-mail (JazzyGroomsILLC@gmail.com). 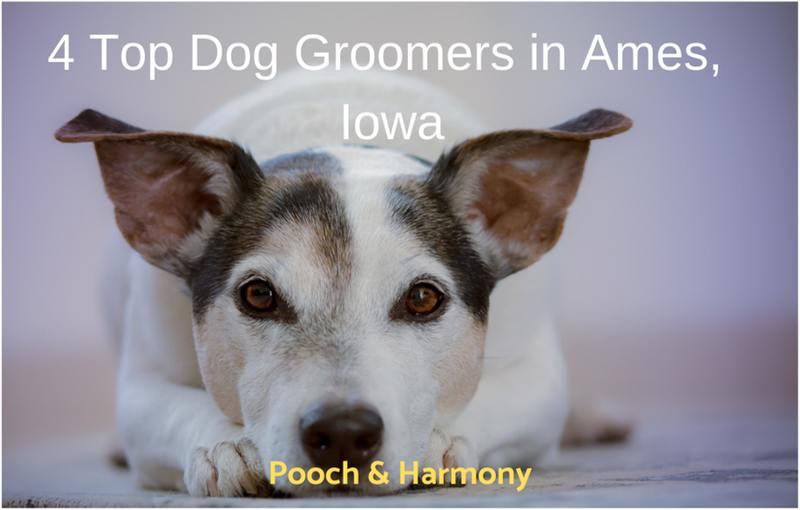 Do you know of any other dog groomers in Ames, Iowa? Please tell us about them in the comments box below!